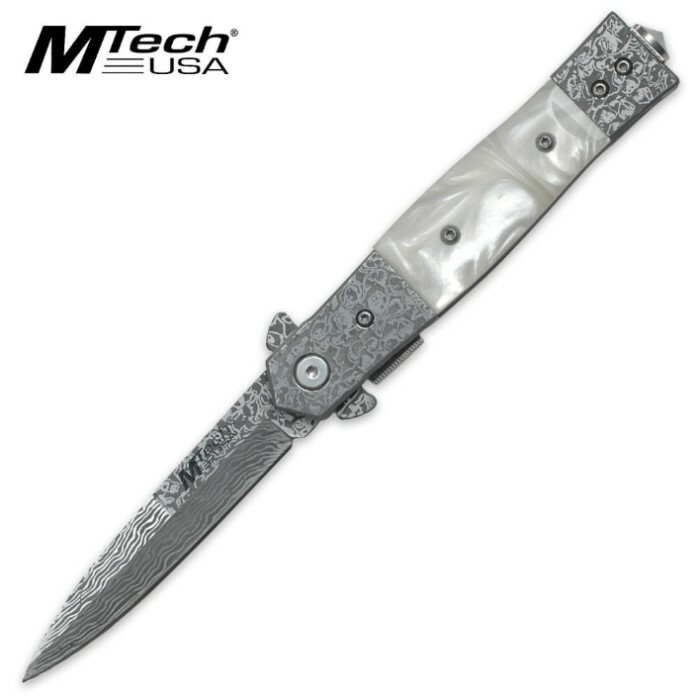 MTech USA Damascus Steel Pearl Folding Pocket Knife | BUDK.com - Knives & Swords At The Lowest Prices! Quality and style are evident throughout in this exquisite Damascus and pearl folding pocket knife. The spear point Damascus steel blade is razor sharp and features a blade spur for one-handed opening. The elegant handle features a white pearl overlay, accented by Damascus bolsters and completed by a stainless pocket clip and glass break spike. It is a wonderful well built knife,but I do not think it is true damascus steel. it says 440 on the blade. This is one of the best knives I own, I bought an identical knife from BUDK but it had a blue handle. The blade is very fine and almost never dulls. I would recommend this knife to anyone that wants a amazing quality knife for a low price. I think this is THE BEST KNIFE for it's cost and is very durable.